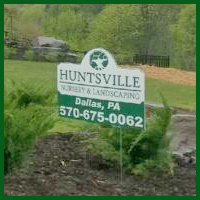 Huntsville Nursery & Landscaping has been providing quality landscape design, installation, and maintenance services to the Back Mountain and Wyoming Valley area since 1924. Our award winning projects have been the hallmark of Huntsville Nursery & Landscaping commitment to creativity, quality, and service in both residential and commercial settings. Huntsville Nursery & Landscaping takes great pride in the products & services offered. All of our trees, shrubs, and plants are hardy northern grown. Our experienced and professional staff is here to answer any and all of your landscaping questions. From start to finish, we work closely with each of our customers to make sure all landscaping needs are being met.